Kajal A. Bhatt Assistant Professor, Dept. of Anaesthesiology, GMERS Medical College & Civil Hospital, Sola , Ahmedabad, Gujarat, India. Ila A. Prajapati Assistant Professor, Dept. of Anaesthesiology, GMERS Medical College & Civil Hospital, Sola , Ahmedabad, Gujarat, India. Background: Monitored Anaesthesia Care is a planned and suitable technique for tympanoplasty surgeries.The present study has been conducted to compare the effectiveness of dexmedetomidine with combination of pentazocine and promethazine under local anaesthesia with primary end point being the haemodynamic stablity, sedation score and patient and surgeon satisfaction. Subjects and Methods: A prospective randomized double blind study was conducted in 60 ASA grade I-II patients in age groups of 18-60 years undergoing tympanoplasty surgeries. Patients were divided in 2 groups of 30 patients each. Group D received dexmedetomidine loading 1µg/kg intravenously followed by 0.2µg/kg/hr infusion whereas Group PP received pentazocine and promethazine 0.5 mg/kg intavenously followed by normal saline infusion at 0.2µg/kg/hr .Patients were assessed for Ramsay sedation score,intraoperative haemodynamic parameters, surgical bleeding score,patient and surgeon satisfaction scores, VAS score, need for rescue analgesics and side effects if any. Results: There was no difference in demographic data in both groups. Ramsay sedation score, surgeon and patient satisfaction scores were significantly higher in Group D than Group PP (p<0.001). Intraoperative bleeding scale and Haemodynamic parameters like heart rate,systolic ,diastolic and mean arterial pressure were significantly lower in Group D than Group PP (p<0.001).Lesser number of patients requiring rescue sedatives and analgesics in Group D as compared to Group PP(p<0.001). There was no significant difference in side effects in both groups. 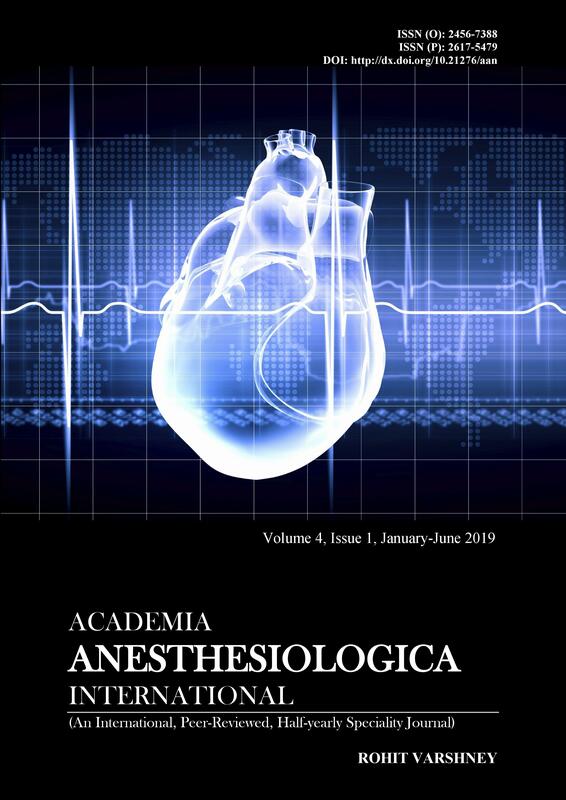 Conclusion: We concluded that Dexmedetomidine provides adequate sedation with better haemodynamic stability,good surgical field vision, surgeon and patient comfort without any adverse effects in tympanoplasty patients under local anaesthesia.